Cool new analog style from 01 THE ONE featuring turning discs that rotate to display the time. The outer disc is hours and the inner discs displays minutes and seconds. The time is indicated by reading the numbers that are lined up with the arrow. The case and strap and case are custom designed with an innovative blending concept combining different materials. 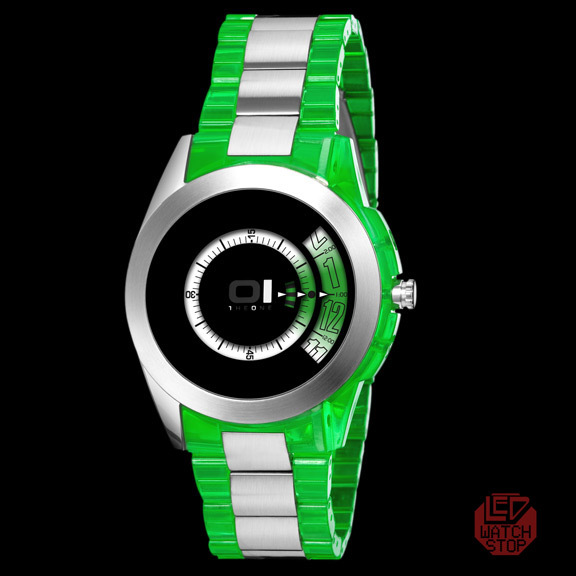 The stainless steel case has one clear hardened PU edge (with green tint) featuring a unique PU & stainless steel combination bracelet. Extremely light, comfortable, colorful and fashionable. Express your style.....be THE ONE!